In the Pacific Northwest, wintertime forage on unimproved pastures is senescent and of low nutritional quality. Late summer and fall pasture is limited by the July-September rainless period. However, during April, May and June, grass growth is abundant, and animal growth is rapid. Our area produces much of the world's grass seed, as it has the ideal climate for cool-season grasses. These forage patterns dramatically affect weight gain. This is why it is futile to make comparisons between animals raised in different conditions. Rapid weight gain says more about ranch forage conditions and parasite control than it does about genetic quality. 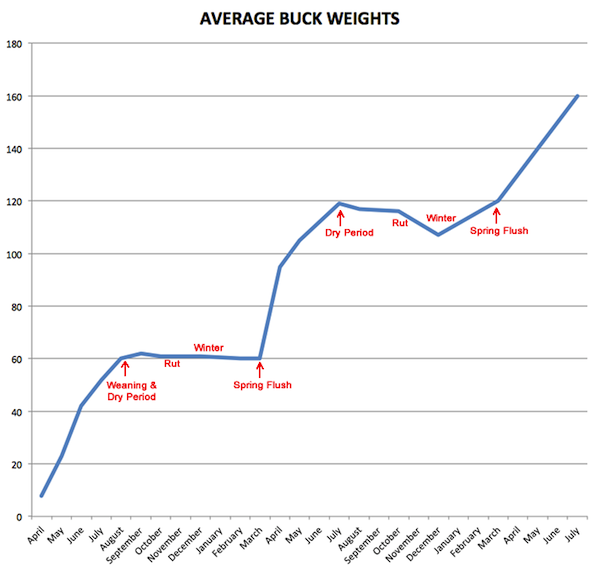 Below are our average herd weights. Almost all weight gain in the first two years of life is made during the spring, when feed is plentiful. The rest of the year, the animal is essentially waiting for another chance to grow. Mature does follow a different weight cycle pattern centered around pregnancy and lactation. It is not uncommon for yearling animals coming off a hard winter to gain 50 pounds in two months, once spring arrives. The phenomenon of rapid gains after a period of feed deprivation is called compensatory gains. Since paying for feed can easily ruin the profitability of a farm, so long as animal health and productivity can be maintained, it can be cost effective to allow animals to lose weight over the winter, and rely on compensatory gains to produce rapid weight recovery in the spring. 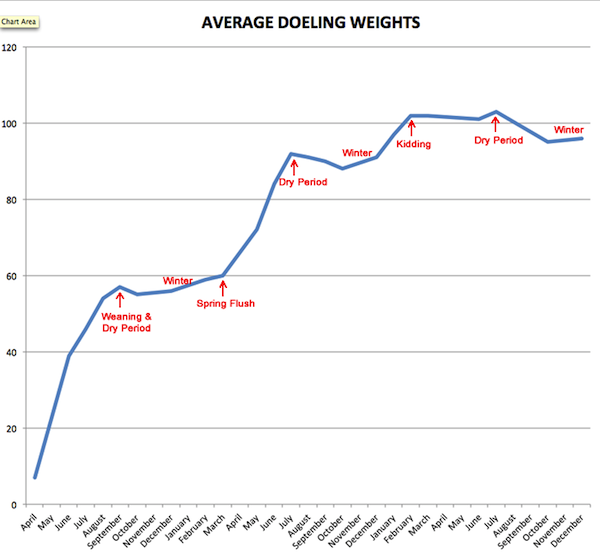 Below is our mature doe weight cycle. Mature does gain and lose weight at opposite times from younger stock. Does gain weight readily during the lean winter months due to pregnancy hormones and metabolism, while younger animals stop growing. Mature does do not put on weight during the spring grass flush due to lactation demands, even though younger animals are gaining rapidly.